I rip all my cd's on mp3 to listen them on others computers/pda/laptop in my house. So, I need a script to build,share and access mp3 list. And voilà. Multiples parameters to build your own mp3page. ID3 popup (if you use http://getid3.sourceforge.net). Possible use on Flat and Recursive Table. Integration of lyrics and guitar tab. 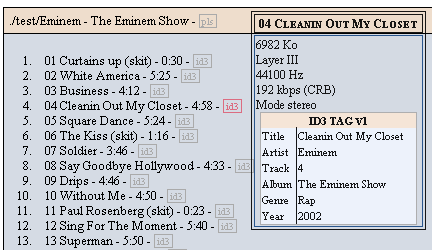 Small Sample : Directory/SubDirectory Lyrics, mp3 files with ID3V1,ID3V2 and no tags. If you wanna use id3tag, you must download http://getid3.sourceforge.net to read them. Put all file in a sub-directory call "mp3"
Archive Zip (don't forget http://getid3.sourceforge.net, in a directory mp3). 11/10/2002 18:12:48 - Update PlayList Link (change scan.php into mp3catgbuilder.php). 11/10/2002 18:18:43 - Update PlayList (mistake in variables change). (editor with refactoring needed ;). 14/10/2002 19:15:15 - " not allowed in idcard. 14/10/2002 20:52:54 - V 1.1. 14/10/2002 23:10:01 - Implements Lyrics html. 15/10/2002 01:26:49 - Modified images options. 15/10/2002 01:53:12 - Computed time and stats. 15/10/2002 03:30:52 - Personalize extensions. 15/10/2002 18:02:35 - Bug corrected when don't use Id3. 15/10/2002 18:10:12 - Add Filesize In Stats. 17/10/2002 12:02:12 - V 1.2 First public release. 03/03/2003 02:06:17 - V 1.2a Bug Fixes and minor changes. 03/03/2003 02:20:43 - V 1.2b Bug Fixes and minor changes. Build Sql script for including in database. 11/10/2002 18:39:12 - Error playing wav file with winamp 2.x on a secure site (login/password) (fixed in 2.81).